MCR has established itself as a true market leader when it comes to sheer range and quality of its apparel. Through cutting-edge designs, innovative manufacturing processes and exceptional fabric quality, we have developed products that speak volumes of our high standards and brand excellence. We strive to create a visual treat for our customers when they enter the store and enchant them with our range of beautifully designed clothing. Our customers always find what they are looking for when they browse through the many exquisite brands in our textile repertoire. Our long and lasting legacy has ensured that we are the textile of choice when it comes to quality, fashion and versatility. Although we have an extensive product range, we market them through three major brands. Majority of our prominent collections are distributed via brand MCR. The watchwords here are tradition and innovation. Our exquisitely designed Kerala sarees and our elegant traditional dhotis for men are designed for style as much for conventional value. They keep us rooted to our history while also growing with emerging trends. 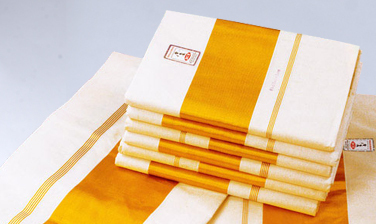 Our Dhoti range is prominent in the market for its unique stain-free, wrinkle-free features and the original and creative jari work by highly skilled craftsmen. It is about comfort as much as making a statement. Our white and cream linen shirts are tailored specifically to match our trademark dhotis. All our men’s festival and groom collections are colourfully made with attractive designs to suit the occasion. You can also purchase our elegant and classic Dhotis for men online or browse around the women’s kurtis online store. Our traditional white cotton shirts are classy yet made for comfort and go very well with our ethnic or political wear range such as dhotis. They are 100% percent cotton shirts that are perfectly suited to handle the hot and humid south Indian climate. We have both half sleeve and full sleeve formal shirts that are available in a range of different styles and fits, made to suit any occasion. We put our best foot forward when it comes to quality and each and every fibre in our shirt is of the excellent quality. The usage of Dhoti has been in vogue in India since very ancient times and still holds sway despite the advent of several western trends. They may have replaced them to some extent but for important traditional occasions there is no substitute for the vintage dhoti. At MCR we produce both white dhotis and cream dhotis that go well with any shirt. We have a wide variety of designs when it comes to the jari borders, embroidered and patterned by some of the most skilled indigenous weavers using state-of-the-art looms. Our designer dhotis aim to combine this traditional drapery with comfort and style. We want our dhotis to be a symbol of inherent culture and a fashion statement at the same time and to represent our cultural richness and exuberance. We want to redefine the image of the cotton dhotis by successfully adapting it to today’s fashion all the while retaining its dignified integrity. We have a range of dhotis for men that can go well with different occasions whether it is for casual and daily wear or for formal and festive junctures such as a wedding or other religious functions. We have a total of 120 varieties of dhotis including stain free, wrinkle free, perfumed and jari worked. We can also customise upon customer’s request. There are not many that can match us when it comes to quality. A lot of care goes into the production and a great attention to detail. In order to serve our customers better and makes things more convenient for, we have made our 100% cotton dhotis available on our online shopping. This is in addition to our massive textile wholesale showroom. You can go through our online galleries, pick the style of your choice, send us your queries, book the merchandise online and have it delivered to your doorstep. Our customer service team is always there to serve you in case of issues. We always ensure that your shipments arrive within the promised time frame. Our impressive colour cotton shirt collection is part of our very popular Rixo brand. Aside from the conventional apparel, our repertoire also extends to trendy, sporty and modern outfits. Out extensive range of casual shirts has been specifically designed for demographic segment that is in tune with the contemporary style and fashion, in other words, the youth. To provide our valuable customers with more options we also showcase a range high end of formal shirts and linen shirts. Our success can be attributed to making early headway in this segment and creating a niche brand that has evolved an image of its own. Our readymade casual shirts have been an immense hit among our loyal customers. And besides the loyalists has also managed to pull in more brand ambassadors due to its unprecedented popularity. With our Rixo range we wanted to show that we had not forgotten the needs of men. Our collection of vests and briefs are manufactured using state-of-the-art equipments and up-to-date technologies geared towards high-end gentlemen’s innerwear. We strive for international quality and benchmark when it comes to innerwear. Driven towards comfort and durability and comfort taking precedence, we give utmost attention to each stage in the manufacturing process. We aim for the perfect fit and for a print that does not fade. It is refreshing to wear and provides the feeling of ease throughout the day. Rixo also showcases a wide variety of formal and casual shirts in numerous shades, colours and finishes ranging from half-sleeve, full-sleeve, and regular to slim fit. Roshini is our exclusive collection of fancy Churidhars and inner wear for the woman on the go. The name immediately evokes a youthful and trendy image with a touch of class that can bring delight to any woman’s wardrobe. Whether it is a festive occasion or a party with friends, we have a designer range of ethnic kurtis and churidhars, both cotton and synthetic, tailored to suit your requirement. Our churidhars are made to complement, even enhance, the beauty of the wearer and bring out the particular personality and character. Our collection is ideal for any woman looking to bring out the diva in her. You have an almost limitless number of designs to choose from of varying colours and styles. All our cotton innerwear is of premium quality, with an increasingly vast collection, made for comfort and suited to the needs of the Indian woman.